I’m wading waist-deep in boxes of books. There is, in theory, a methodical plan around this packing up task, but it’s still looking so challenging. Eight boxes of books have already gone to Oxfam – there will be a minimum of eight more going out … so Adrian hopes. The Swedish Church have kindly agreed to take the Swedish language ones. When you have two free pulp books a day as one of your terms and conditions of employment and a 70% discount over a period of years … it takes someone stronger than I to resist the temptation to take up this offer. There’s so many and when you haven’t read them all – it’s hard to get rid of a book that might just contain the meaning of life or otherwise be a perfectly hidden gem. The job is made harder by the fact that I have so many books that belonged to my parents. But I’ve taken the plunge and now I feel a real need to get rid of as many as humanely possible. That goes for other possessions – clothing, bric a brac etc. I’ve spent too many days of my life just sorting through one lot of stuff or another and fighting my genetic predisposition to hoard when I could have been reading, writing or making books not just moving them from shelf to box and back again, and again. And again. So this whole stage in our lives is not just about taking to the road and seeing where it goes, it is also about freeing ourselves from our usual habits and opening ourselves to new opportunities and experiences. 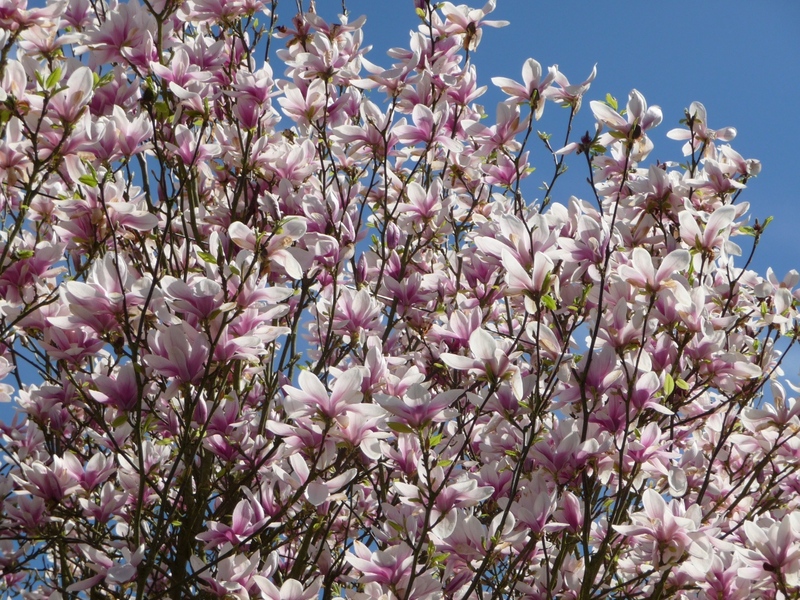 The lovely spring weather and our full-bloom magnolia tree are helping to lift the weight of the drudgery around shifting never ending boxes!